Exit Strategy: You can't leave Japantown without crazy snacks from Dobashi Market. THE QUESTION I get most, next to "Why aren't you fat and white?," is "Where can I get good eats in Japantown?" I've been chowing in San Jose J-townthe area bordered by First and 13th streets and Jackson and Taylorfor more than two decades now. In honor of Obon Festival (July 9-10), I'm blowing up some of my favorite dishes and spots. Kubota: I've eaten here on birthdays, when in-laws are in town, family get-togethersanytime I need to impress out-of-town guests. This is the special occasion restaurant in J-town. Nothing fruity here, just straight sushi and Japanese standards with some interesting fusion tapas. My man Ryoki hooks up the wicked flava combinations behind the sushi bar. 593 N. Fifth St., San Jose. 408.279.8440. Negitoro don and tanuki udon at Kaita: This off-the-menu specialty at Kaita is my favorite lunch meal. Tuna belly is chopped up, mixed with diced green onion and served over sushi rice garnished with tamago egg and a shiso leaf (sometimes with ikura roe, too). Running sidecar is a small bowl of udon soup with a handful of crispy tempura batter bits taking a hot bath. If freshness dictates, they'll sub the Sansai udonwhich is the same delicious udon noodles and broth garnished with mountain vegetables. A family friend from Japan says that both negitoro don and tanuki udon are considered "home-style" food. Me say, the combo is banging. And another reason to love Kaita: they're one of the few sushi spots in J-town that have nattomaki (highly divisive fermented soybean rolls) on the menu. 215 Jackson St., San Jose. 408.287.5551. Steamer basket at Minato: With so many tempting high-calorie items like tempura and tonkatsu, I normally eschew steamer baskets, but I'll take the one at Minato. The mix of veggies and seafood always comes correct and the dipping saucesponzu and peanutmakes me briefly consider a healthy lifestyle. All the benefits of a hearty J-town lunch without the crash. 617 N. Sixth St., San Jose. 408.998.9711. Fried rice, poke, spam musubi, saimin at Hukilau: The fried rice contains spicy Portuguese sausage, the ahi and tako poke are made to order, the noodle and dashi broth for the saimin closely approximates the real deal and Spam musubi is automatic. J-town is fortunate to have all these island-style goodies. Hukilau sells fruit punch, too, the sign of an authentic Hawaiian drive-in eatery. 230 Jackson St., San Jose. 408.279.4888. San Jose Tofu: Consistently precise and silky every time, San Jose Tofu is often credited for elevating the tofu standard on the West Coast. And they use it all: San Jose Tofu sells the spent soybean casings to Ramen Halu to make its okara salad. SJT also sells fresh soy milk in the afternoon, a real treat. 175 Jackson St., San Jose. 408.292.7026. Katsu curry at Gombei: From the number of Japanese nationals queued up at lunchtime, Gombei is recognized for serving the most authentic Japanese lunches around. For that, the pork cutlet smothered in curry next to a rice mountain will bring back memories of that hole in the wall near the subway station. Your breath may smell like the insole of a Birkenstock at a Jimmy Buffett concert, but it feels so good. No. 2 meal choice is the udon, which can fill up a sumotori. 193 Jackson St., San Jose. 408.279.4311. 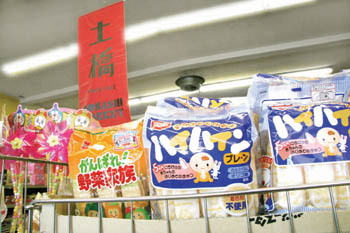 Asian snacks at Dobashi Market: It's impossible to leave J-town without a bag of lychee or melon gummies, Milky candy, Super Lemons, arare rice crackers, Pocky dipping sticks, crack seed, dried cuttlefish, Pokari Sweat or Ramune melon soda. Head to the back counter for a diverse selection of pickled vegetables in electric colors. 240 Jackson St., San Jose. 408.295.7794. Teriyaki booth at Obon Festival (July 9-10): I've put in work there for the past couple years. It's a lot of fun just witnessing the hierarchy. The old guys peel corn, cook the chicken and hog the beer. The younger guys do the beef. The girls run the counter. The same old man does the marinade. No measuringjust sugar, garlic cloves, shoyu, lemons, ginger and boxed white wine. The result is magnificent and we always run out. Come through this weekend and holla at your boy. www.japantownsanjose.org. J-Town Progressive Dinner (July 14): Presented by South Bay First Thursdays, this wandering feast/walking tour of Japantown includes stops at local restaurants where participants can sample appetizers, entrees and desserts and mingle with community leaders and insiders. The walk also stops at the Issei Memorial Building and Japanese American Museum. Reserve your spot soon. The fee is $25 per person. Visit www.firstthursdays.org for info.